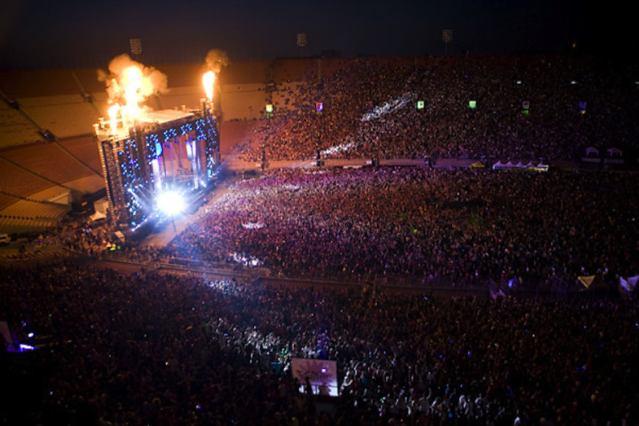 Electric Daisy Carnival Promoter Arrested: Is This Part of the War on Raves? The man behind the massive dance-music festival Electric Daisy Carnival, Insomniac Events CEO Pasquale Rotella, has been charged, along with five others, in a massive corruption case that the Los Angeles district attorney says may result in the “financial ruin” of the city’s iconic stadium, the Coliseum. The indictment, which includes 29 counts of bribery, embezzlement, conspiracy, and conflict of interest spread among the defendants, illustrates a complicated web of backroom dealings. Allegedly, the result is more than $2.5 million diverted from the public venue that played host to the flagship EDC (and similar festivals) into the pockets of two city officials, Coliseum Events Manager Todd DeStefano and General Manager Patrick Lynch. Rotella and rave promoter Reza Gerami of Go Ventures are accused of helping to orchestrate. See photos from last year’s wild Vegas Electric Daisy Carnival. After posting his $1.2 million bail, Rotella’s attorney Gary Kaufman called the charges against his client “clearly politically motivated and publicity driven.” His statement, circulated by Insomniac, maintains the innocence of the company’s founder, who’d face a maximum of 13 years and eight months if convicted. But Lynch’s lawyer too initially denied wrongdoing, and the venue manager has since plead guilty to a separate kickback scheme involving a Coliseum janitorial contractor who remains at large (possibly in Panama). The city’s 13-month investigation followed a series of articles by the L.A. Times exposing questionable practices at the Los Angeles Memorial Coliseum, home to the University of Southern California’s Trojans football team and two-time host of the Olympics. The newspaper began to poke around shortly after 15-year-old Sasha Rodriguez died of ecstasy-related causes at a hospital after attending EDC 2010. Ensuing public outcry has ranged from helpful to hysterical, and has colored every aspect of the story since. But this is “a paper case,” as Gibbons points out, and details of the scandal seem cut and dry. DeStefano is accused of starting a private company under the highly suspect name “Los Angeles Coliseum Events.” Gibbons forwarded SPIN a handful of documents, including a 2008 contract between LACE, Insomniac, and Go Ventures that initiated a three-way partnership whose conditions included an unusual consulting fee: 10 percent of gross ticket sales to DeStefano, who was still the Coliseum’s events manager. Those documents also include e-mails sent from DeStefano to Rotella and Gerami (he addresses each as “Brother”) implying that they would pay a reduced rental fee of $25,000 to LACE, who would in turn settle their tab with the city. It’s unclear that the two promoters were aware of any illegalities — as the D.A. alleges, DeStefano used his “cleverly named company to trick” others, including Dreamworks, Coca-Cola, and the producers of American Gladiators, into paying him instead of the Coliseum. For now, Insomniac says it’s business as usual and that “no events will be impacted, including May 12’s inaugural EDC New York, and the second annual EDC Las Vegas, kicking off June 8. To show support, Twitter users, including EDM behemoths Kaskade and the Crystal Method, have adopted the hashtags #FreePasqualeRotella and #PasqualeIsInnocent. But no matter how this shakes out, it’s a considerable setback for the company, which can’t seem to stay out of the headlines for the wrong reasons.